August 29, 2017 1:10 P.M.
Ontario is providing urgent relief to those affected by the opioid crisis, including adding more front-line harm-reduction workers, expanding the supply of naloxone, and creating new rapid access addiction clinics in every region of the province. Expanding proven harm-reduction services, such as needle exchange programs and supervised injection sites. Improving data collection and monitoring to support early warning activities. With these new and additional investments, and the government’s commitment to invest $20 million annually in Ontario's Chronic Pain Network, over the next three years Ontario is investing more than $280 million to combat the opioid crisis in Ontario. Beginning this fall, Ontario is investing an additional $222 million over three years to fight the opioid crisis, including over $15 million to support health care providers on appropriate pain management and opioid prescribing; over $7.6 million to increase addictions treatment in primary care; $70 million on long-term support for people who have addiction disorders; $9 million to add more front-line harm-reduction outreach workers in communities across the province; and, beginning in 2018-19, $20 million over two years for specialized support for Indigenous communities and developmentally appropriate care for youth. Previously announced initiatives in Ontario’s Strategy to Prevent Opioid Addiction and Overdose include initiatives to modernize opioid prescribing and monitoring, help people in pain get appropriate treatment, and improve the safety and health of people who are addicted to opioids. The updated Opioid Strategy incorporates feedback from broad public consultations with health care providers, professional associations and colleges, academics, front-line workers, and people who use drugs and their friends and families. The province's 10-year funding agreement with the federal government will also help to support this plan. 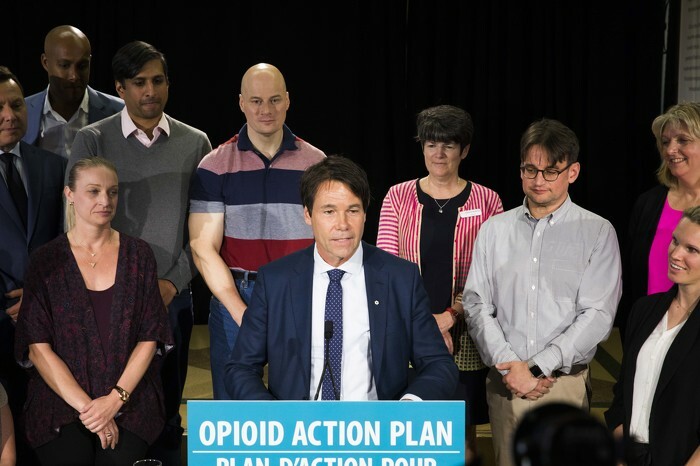 Minister Hoskins speaking at an event, with clinicians, harm reduction workers, people with lived experience and Community Health Centre outreach workers behind him.